Apart from four years of post secondary education Bob has devoted his entire career to the education and development of young people in Grande Prairie. Sport and recreation, broadly defined, are his major tools for influencing young people but hockey was and is still his favorite game. Hockey is in Bob’s genes. His Dad was a highly skilled rover in Manitoba during the 1920’s when hockey lineups consisted of six, not five players on the ice. When Bob was six his Dad fittingly introduced him to “bob” skates and the ice. Chores such as hauling water and splitting wood kept Bob busy in his youth but in spare moments he laced his skates and using tattered antiquated equipment from his Dad’s era joined hockey buddies to scrimmage on outdoor rinks or after sun down to play shinney under a street lamp making way for occasional cars and horse drawn sleighs. As a young teen, seniors on the hometown team were his heroes and admission to watch Saturday night games in the old Wapiti Arena had to be earned. As a “town crier, ” equipped with a cowbell and a sandwich board, he would walk up and down Main Street to advertise the game. Later, as a rink rat, and part of Hockey Legend Johnny Macdonald’s ice making team he would scrape the ice between periods and take his turn as a goal judge. As a player, Bob’s speed, smooth skating style and unselfish but clever play-making ability earned him an invitation to try out for a position with one of Canada’s premiere junior clubs, the Edmonton Athletic Club (EAC’s). Although Bob certainly had potential to become a career hockey player, he had other plans and returned home to finish school and play senior hockey. He moved to Edmonton for four years graduating from the University of Alberta with a degree in Physical Education. From 1951 to 1954 while earning his degree, Bob played with the U of A Golden Bears along with the likes of Clare Drake. Upon returning to Grande Prairie, Bob taught Physical Education at the Grande Prairie High School and was playing coach of the Grande Prairie Athletics. He converted from left wing to defense and fans watching him during this period recall his superb skating ability and his skillfully administered hip checks made possible by quick lateral moves. Bob continued to play for the Athletics during the 50s and 60s and is remembered for his skill, sportsmanlike play and his fierce dedication to fitness. At another level, Bob is remembered for a number of innovations and leadership initiatives. For example, at a time when there was no junior hockey in Grande Prairie and minor hockey was in its infancy, he organized a High School Hockey League and developed a High School Hockey Curriculum that attracted attention at the Provincial level. Subsequently he was commissioned to develop a Provincial High School Hockey Curriculum that was used throughout the Province. Over the years Bob has been the recipient of awards and honors too numerous to mention. They include The Alberta Commercial Traveler’s Sportsman of the Year Award in 1968 and in 1978 the Honor Medallion presented by the Canadian Association for Health, Physical Education and Recreation. Bob continues to be a strong supporter of local senior, junior and minor hockey. He was and continues to be a role model for countless young people including athletes who have moved on to make a career of hockey. He regularly works out on the ice with other old timers and can be seen and heard at games where he vigorously encourages the competitors including his grandsons that have inherited hockey skills from their grandfather, uncles and great grandfather thereby perpetuating a Neufeld family hockey tradition. 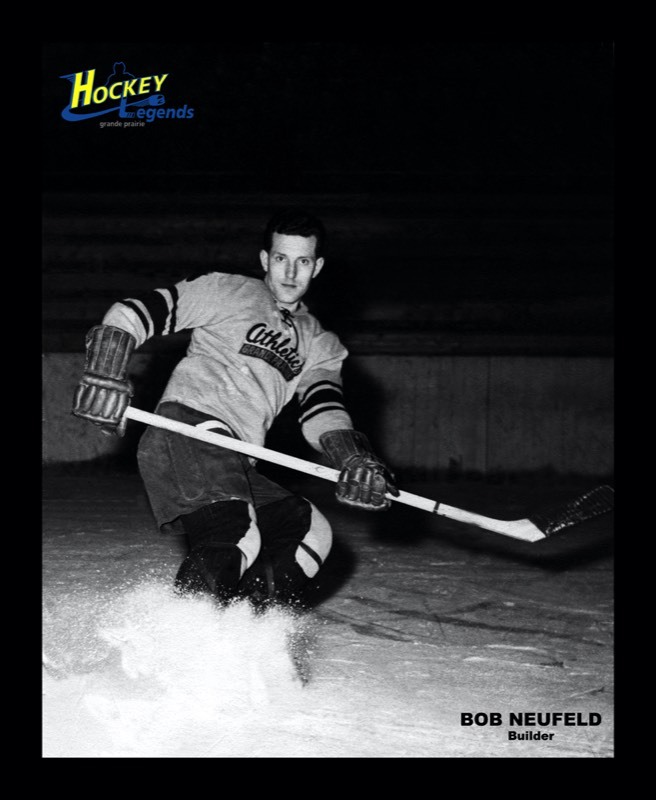 Bob Neufeld - a Grande Prairie Hockey Legend in 2005.